I had written him a letter which I had, for want of better Knowledge, sent to where I met him, down the Lachlan, years ago. 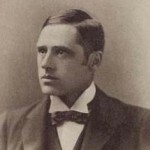 Banjo Paterson was an Australian bush poet, journalist, author, and Georgist activist. He wrote many ballads and poems about Australian life, focusing particularly on the rural and outback areas, including the district around Binalong, New South Wales, where he spent much of his childhood. Paterson's more notable poems include "Waltzing Matilda", "The Man from Snowy River" and "Clancy of the Overflow". In 1885, Paterson began submitting and having his poetry published in the Sydney edition of The Bulletin under the pseudonym of "The Banjo", the name of a favourite horse. In 1890, he wrote "The Man from Snowy River", a poem which caught the heart of the nation. Paterson was also a journalist, lawyer, jockey, soldier and a farmer.